Under the Fair Credit Reporting Act, the reporting company and the information provider are responsible for correcting any credit report disputes. However, they must first be made aware that you have credit report disputes. A person can report and correct errors in their credit report by following two easy steps. Step one is to report your error to the consumer reporting company in writing and make them aware that you have a credit report dispute. Make sure you include all your personal information like your name, address, and a list of each credit report dispute that have. Remember to send your letter by certified mail to prove that you have initiated a credit report dispute. The consumer reporting company will then investigate your credit report disputes and respond in 30 days. If they find there is an error and the credit report dispute can be resolved by correcting it, then they will forward the information to the other credit bureaus, and your credit report will be revised. After reviewing your credit report dispute, the consumer reporting company may decide that they disagree with the items raised in your credit report dispute and declined to pursue the matter any further. They will send you all of the evidence that they have and the reasons for not pursuing your credit report dispute, along with a copy of your credit report. 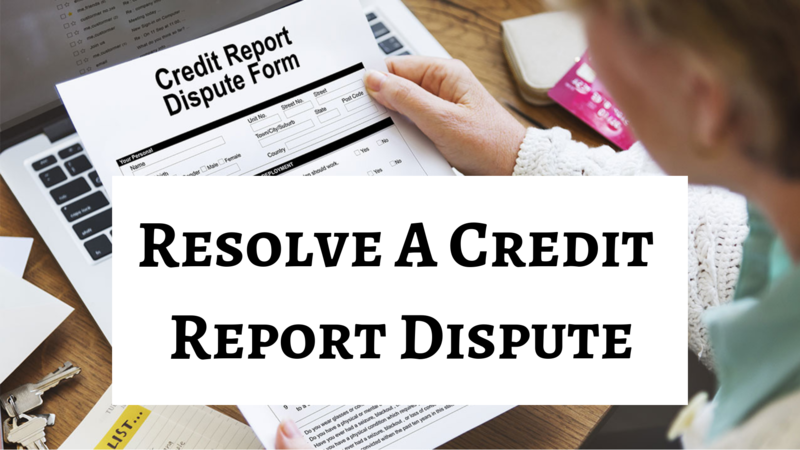 Another way to handle a credit report dispute is to contact the particular creditor directly. Again, send the creditor a list of your credit report disputes in writing. Be sure to call your creditor and ask for the specific address of where credit report dispute issues need to be sent to ensure that there is no unnecessary delay in the credit report dispute being investigated. Many companies have a separate address for handling credit report disputes, and it can take time for it to be forwarded to the correct address if you do not send it there initially. If you are correct in your credit report dispute and there is an error, they will report the error to the credit bureaus and send you notification of the change. This item (identify the item(s) disputed by the name of the source, such as creditors or tax court, and identify the type of item, such as credit account, judgment, etc.) is (inaccurate or incomplete) because (describe what is inaccurate or incomplete and why). I am requesting that the item is removed (or request another specific change) to correct the information.